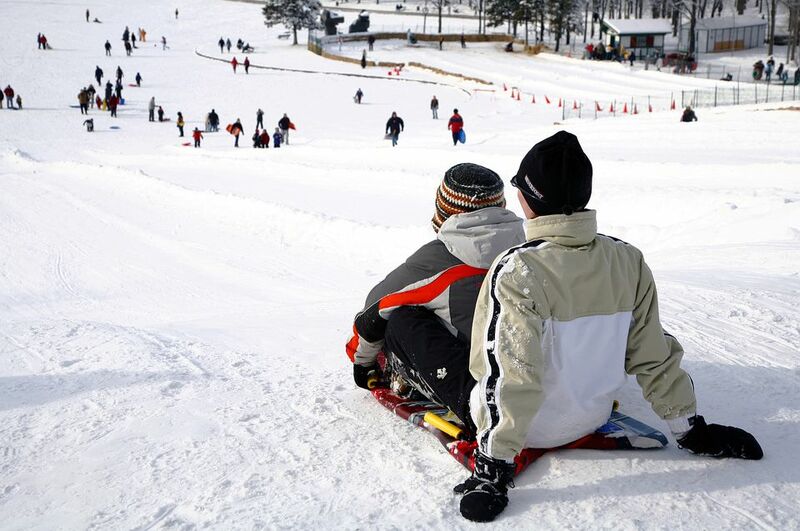 The ultimate winter playgrounds are the places that have snow hills perfect for sliding. These pop up all over Montreal as snow falls and seem to multiply through the season. Most of those hills are small and don't have staff renting out sleds, toboggans, or crazy carpets. But most of the parks on our list rent out sliding equipment and all offer more sliding surfaces than your standard neighborhood mounds. Most park equipment rental offices, restrooms, and locker rooms are closed on both Christmas Day and New Year's Day in Montreal. Parc du Mont-Royal not only has one of the city's best sliding setups, but it's also a great spot to head to if you want to try out different winter sports on the same day, like ice skating, cross-country skiing or snowshoeing. As for sliding, either bring your own sled or rent a snow tube. Parc du Mont-Royal is easily reached with public transit. The Mont Royal rental counter has a list of equipment and pricing for both summer and winter sports. Attention families. Parc Jean-Drapeau rents out a variety of winter sports accouterments, including inner tubes, but only for a few weekends a year during the annual snow festival Fête des Neiges. To access the hill and rent an inner tube, users must pay $16 for an ACCROPASSE (it's free for ages 4 and under). Sounds expensive, but the pass lasts for the entirety of snow festival and comes with a bunch of benefits and it grants access to all of them for the 8 days of the snow fest. In 2018, free parent-child kick-sled races are offered every day. While that's not a downhill sport, it's a fun way to glide across the snow. Two hills are set up specifically for sliding at Parc-nature Bois-de-Liesse. Take the des Champs entrance for access. A lovely park by the river, start off with a day of sliding, snowshoeing, and even cross-country skiing, with brunch at Bistro des Moulins, a quaint restaurant on-site. A large, gorgeous park on the northeastern edge of the island of Montreal with crazy carpet and toboggan rentals available at the Heritage chalet. A green space charmer turned winter destination when the temperature drops, Parc Jarry sets up a large sliding mound as soon as enough snow falls to do so. Another park. Another mound perfect for sliding. Great outing for folks living in the West Island.